Matson Inc.'s massive electric crane and the Pillar Mountain wind farm dominate the shoreline near the city of Kodiak. Photo by Margaret Kriz Hobson. 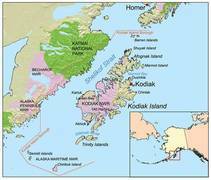 Kodiak Island, located on the southern coast of Alaska in the Kodiak Archipelago, is the second largest island in the United States. Home to approximately 14,000 people, the island has an isolated power grid that is almost entirely supplied by hydro and wind backed up by a 3 MW battery storage system. 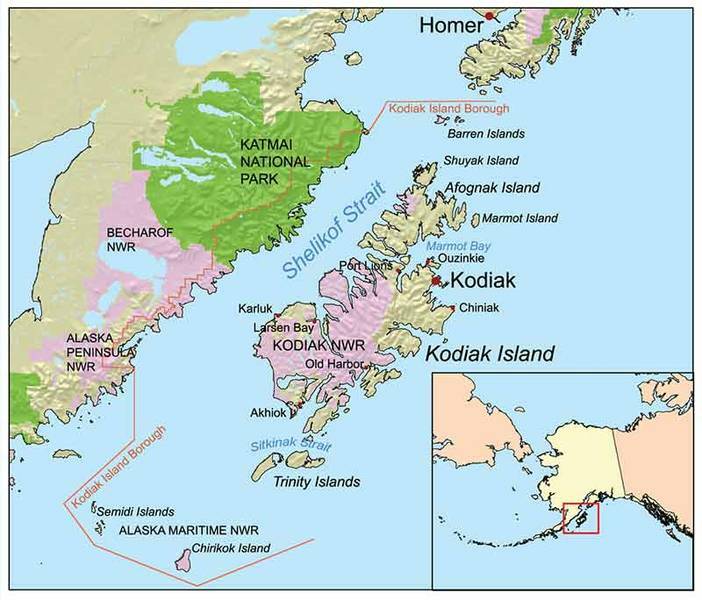 The local electricity cooperative, Kodiak Electric Association (KEA), is committed to maintaining a 95% renewable electricity portfolio although in 2015-16, diesel generators were used to generate only .3-.5% of the community's electricity, making the island powered by almost 100% renewable sources. The main power source in the island's 28 MW electricity mix comes from three hydroelectric plants at Terror Lake. The community bought the facilities back from the federal government for $38 million dollars in 2007, which marked a major milestone in bringing the community's power supply under local control. Until 2009, the hydro power was supplemented by four diesel generation facilities, which are a combination of diesel reciprocating engines and a diesel-fired combined cycle generation unit. In 2009, however, KEA added 4.5 MW of wind power with the successful completion of Phase I of the Pillar Mountain Wind Project. Phase II launched in the fall of 2012 with an additional 4.5 MW of wind power and a 3 MW battery storage system. This has allowed KEA to go nearly 100% renewable. 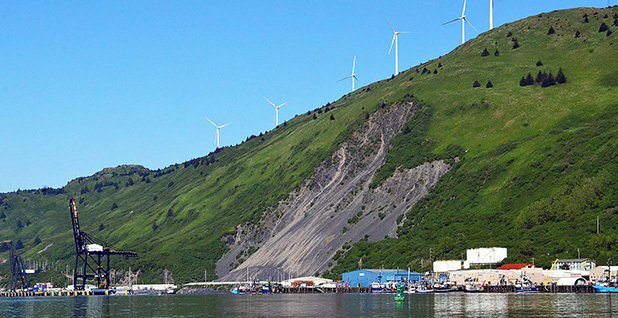 The Pillar Mountatin Wind Project was made possible by a $1 million grant from the State of Alaska and a two- part $12 million Clean Renewable Energy Bond (CREB) low interest loan from the IRS. 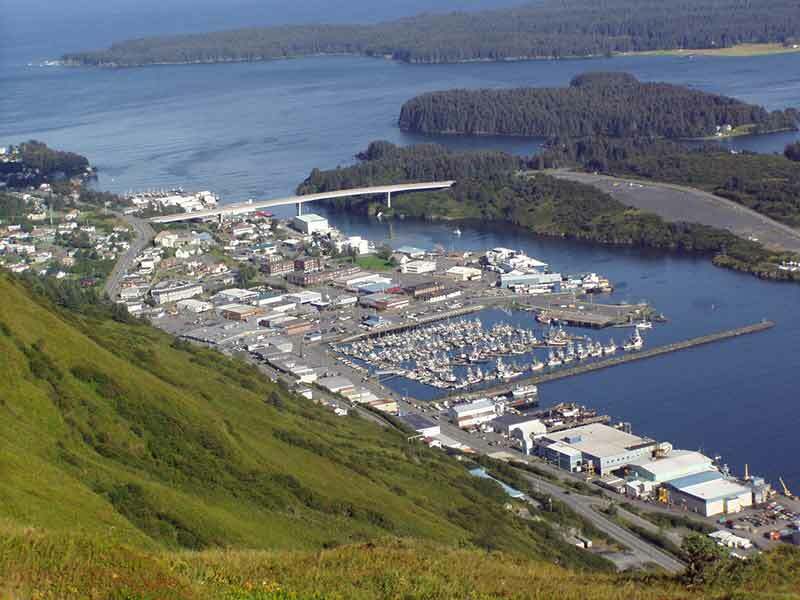 Kodiak Island's renewable electricity generation is complemented by conservation efforts that include promotion of efficient lighting technologies like LEDs. The state government's Alaska Housing Finance Corporation (AHFC) also offers a Home Energy Rebate Program that provides rebates of up to $10,000 to help homeowners improve the energy efficiency of their homes. Notably, KEA reports that there were no system wide outages in either 2014 nor in 2015, despite the transition away from diesel to wind for a significant portion of generation. 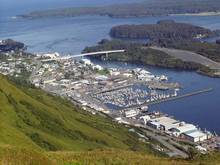 Kodiak Island's success drew the attention of President Barack Obama, who congratulated the community in remarks delivered during a trip to Alaska in 2015. During his remarks, the President announced a $3 million public-private partnership between KEA, the City of Kodiak, and Matson Inc. to jointly finance a renewable-energy-powered shipping crane that would replace a diesel powered crane and make the island the first in the world to put flywheel and battery energy storage together to stabilize its variable electric power from wind turbines.